A great way to decorate by showing off your favorite spot or place you'd rather be! Get it framed or unframed! Note: Dorm life may require choosing unframed due to rules regarding "no holes" in the dorm walls, which makes the framed version not possible. Need Glue Dots For Your Panorama? 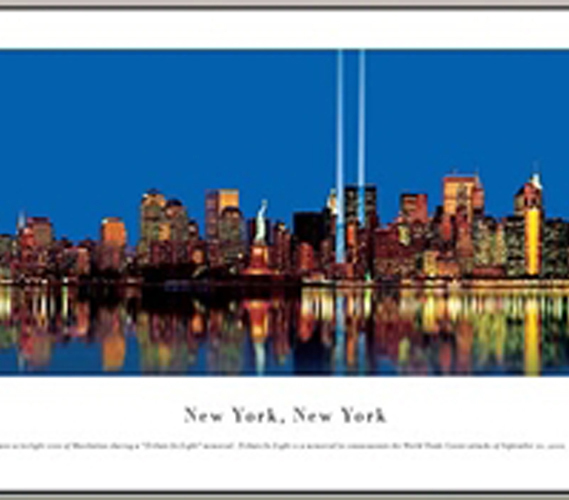 This dorm room panorama will let New York City's Lights adorn your dorm wall, while also providing a powerful memorial to 9/11. New York City is indeed a robust city that still captivates onlookers with its beautiful and full skyline. The two towers of light on this New York City, New York - Tower Lights Panorama serve as a powerful testament and reminder of the former tragedy. While sobering, this dorm panorama can still make striking addition to your college wall decor. Dorm room decorations are essential college supplies, after all; without any college decor, you'll never be able to distinguish your dorm room, and who doesn't want to live in a place that has some character to it? Panoramas can bring the sort of rich detail and level of sophistication that your average poster just can't deliver at times! 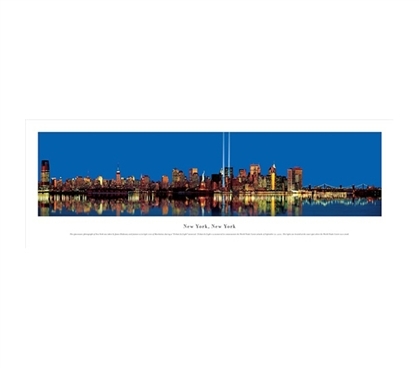 Panoramas are also different and more individualized wall decorations—if you're from New York City, for example, be sure you bring this panorama as part of your college supplies. We'll admit that some dorm decorating ideas can get quite over the top, so keep things balanced with a the striking and refined look of cityscape panorama. *Use Glue Dots to hang the unframed panorama. This panoramic photograph of New York was taken by James Blakeway and features a twilight view of Manhattan during a "Tribute In Light" memorial. Tribute In Light is a memorial to commemorate the World Trade Center attacks of September 11, 2001. The lights are located at the exact spot where the World Trade Center once stood. Centered in the panorama is the Statue of Liberty. On the right side of the panorama are the lights of the Brooklyn and Manhattan Bridges, which connect Manhattan and Brooklyn. The tall building on the left with the red, white and blue lights and tall antennae is the Empire State Building. Your Panoramic Frame will come with a fully adjustable heavy duty cable so it's Ready to Hang! Although our frames far exceed industry standards, our prices do not. You are able to take advantage of huge savings by purchasing direct from us (the manufacturer).